9 Pax and 4 running Dawgs got out of bed on a chilly 21′ degree Saturday morning looking to better themselves no matter what… As the 4 running Dawgs headed out in the gloom, the rest of the pax headed to warmarama…. The cards were shuffled and each pax chose one card to start the 1st round. 9 exercises were performed per round. Some were IC and some OYO. We got through 4 rounds equaling 36 exercises of a mix of: core, cardio, lower and upper body. JOKERS were special. If a Joker was pulled then that pax got to choose which exercise to skip in the round. **after round 2 we took an easy stroll lap around urgent care bldg to catch our breaths. 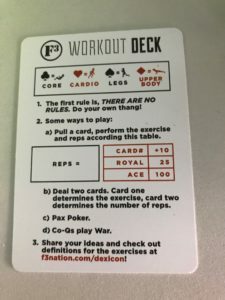 All in all, the F3 deck of cards was great to have and can be played in multiple ways. We sweat, we breathed hard and burned some of calories. Lots of prayers for Guinness and his Family as they deal with the passing of his niece (Lydia) in a car accident last night. Continued prayers from Hokie Pokie’s Mom fighting cancer.